TORONTO, ONTARIO--(Marketwired - April 23, 2015) - Savary Gold Corp. (TSX VENTURE:SCA) ("Savary" or the "Company") has commenced a 15,000 metre drill program at its Karankasso JV project ("JV Project") in Burkina Faso, owned 65% by Savary and 35% by Sarama Resources Ltd. ("Sarama"). Following approval of the program, Savary mobilized a drill contractor and geological and service personnel and commenced drilling on April 21, 2015. The program will follow-up ore-grade intercepts with the aim of extending the strike at five modelled zones and to also test nine newly developed targets with the overall objective of developing a material inferred resource. Don Dudek, Savary's President and CEO commented: "We have embarked on an exciting drill program that was only possible following the overwhelming support from our shareholders during our recent financing. The current drill plan allows the JV Project the flexibility to follow-up within the program, those areas which exhibit the greatest potential to become a centre of gravity. Kien displays the greatest potential to become a centre of gravity deposit with an apparent strike length of close to three kilometres. As a result, drilling has already begun at Kien and will progressively drill test the other zones and targets as the drill moves southward. Once the first pass of drilling is completed, assay and drill chip observations will allow for follow-up of the best zones identified to date." Don Dudek, Savary's President and CEO added: "Significant scope remains for the addition of new drill target areas as not all of the identified artisanal mining sites have been examined. More work is also required to evaluate the 25 km portion of the central gold-bearing trend on the Serakoro 1 concession where a significant amount of gold-in-soil anomalies have not been evaluated. Our philosophy is to continually add value on the ground to create another Houndé belt success story that will catch the market's attention and reward our shareholders." Savary Gold, a Canadian exploration company, along with partner, Sarama Resources Limited, are focused on exploring the 750 km2 Karanakasso Property in Burkina Faso. The properties are in the Birimian age Houndé Greenstone Belt, which hosts Semafo's Mana mine and additional gold deposits that are presently subject to extensive exploration efforts (including Endeavour Mining's Houndé Project, Roxgold's Yaramoko Project and Sarama's/Acacia's South Houndé JV Project, which is adjacent to the Karankasso JV property). For additional information please visit our website at www.savarygold.com and follow us on Facebook, Linkedin and Twitter. This news release may contain forward-looking statements. 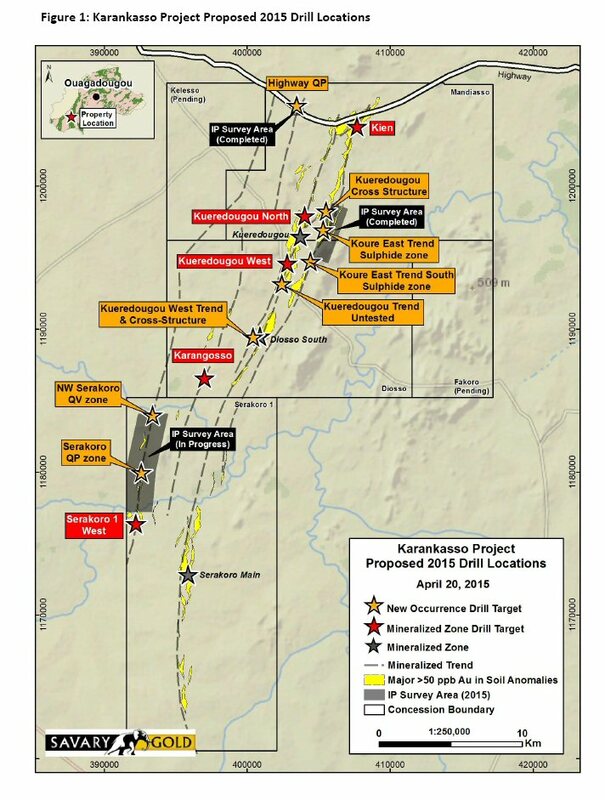 These statements include statements regarding the details of the drill program, the company's exploration plans, the focus on existing drill targets and new targets. These statements are based on current expectations and assumptions that are subject to risks and uncertainties. Actual results could differ materially because of factors discussed in the management discussion and analysis section of our interim and most recent annual financial statements or other reports and filings with the TSX Venture Exchange and applicable Canadian securities regulations. We do not assume any obligation to update any forward-looking statements, except as required by applicable laws.